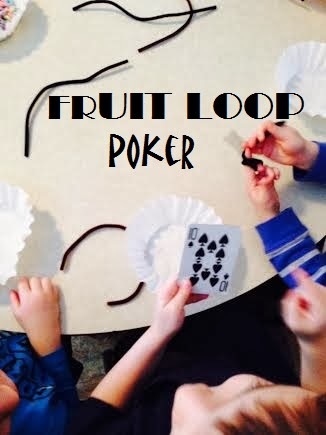 Moments with Little Munchkins: Winning Big with Fruit Loop Poker! Because the game is for kids only, I observed from the sidelines watching the children play. So how does one play Fruit Loop Poker you ask? 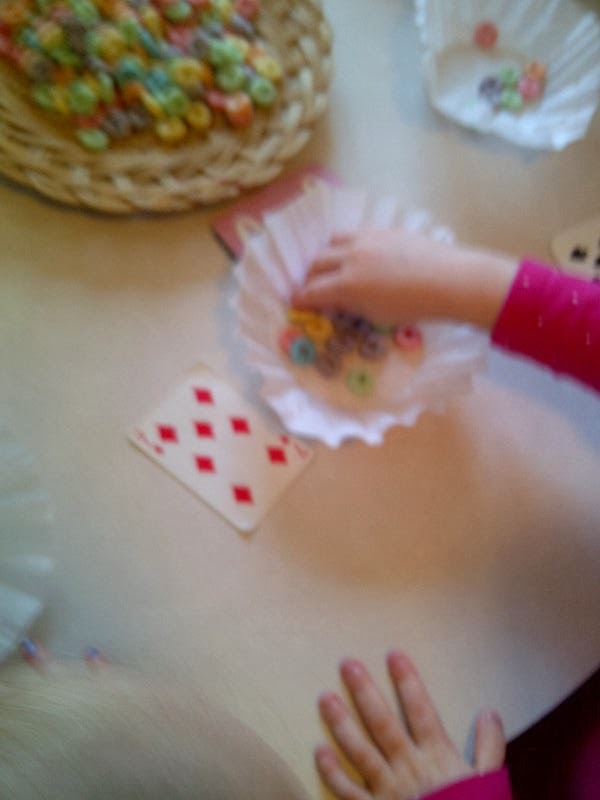 At the table, the children all sat eyeing the jackpot container full of Fruit Loops. (Of course you do not have to use Fruit Loops, but we had quite a bit left over from a previous invitation.) When it is the players turn you pick a card from the deck, say the number, and pick that many fruit loops from the jackpot. It is the player’s decision what to do with the winnings. 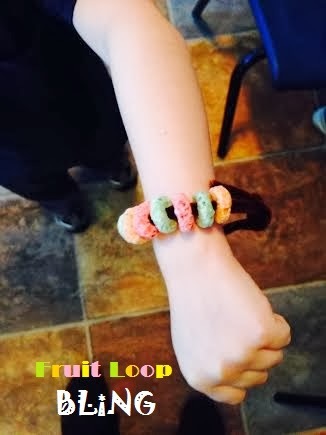 Most decided to eat them, however, Fruit Loop bracelets were also popular. I know you’re probably thinking “that’s it! ?” but to three year olds this was pure bliss! 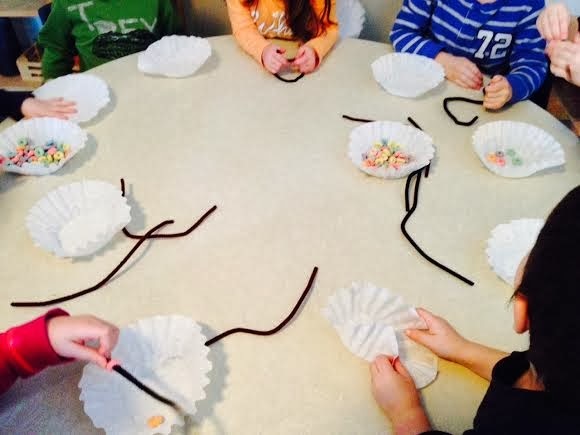 Perhaps the snack of fruit loops had a little bit to do with it, but the learning in this simple activity is vast. 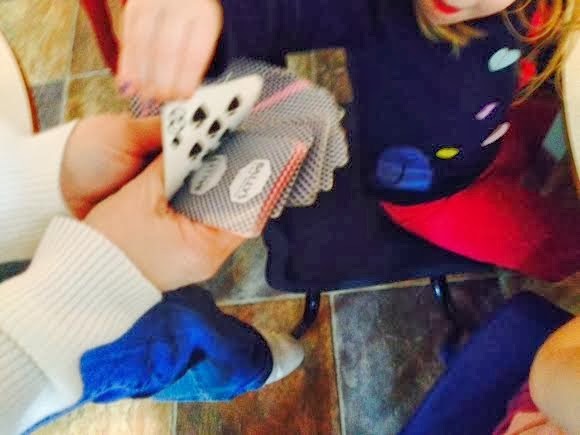 In the afternoon when the 4 year olds joined our group we played the game again. 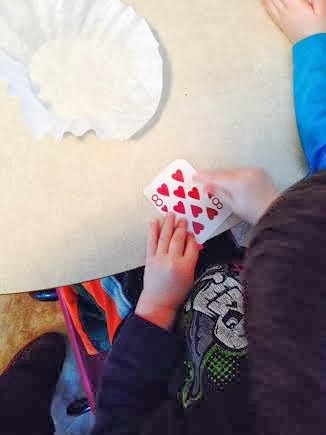 The 3 year old explained the rules to the others and they were just as engaged. Tabatha and I both discussed how we were surprised how well the game went. No one got upset when they only got a low number, or took the other children’s fruit loops. It was a very successful activity that began when Tabatha noticed the attention the box of Fruit Loops was receiving. This game has been popular all week, and I'm sure this isn't the last time we'll play! Do you have any favorite counting games?